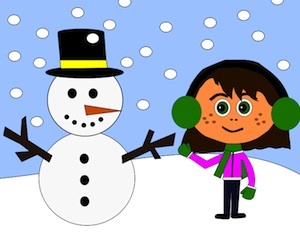 Math Goofy Glyphs are fun and potentially silly activities to help students practice their Common Core math abilities in an engaging way. There are actions for when you get their answers right… and different, goofy actions for when you get their answers wrong! 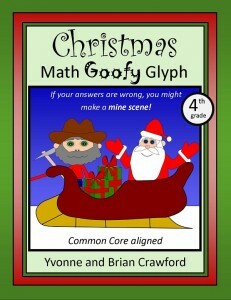 With the Christmas Math Goofy Glyph your goal is to create a Christmas scene with Santa Claus on his sleigh, ready to deliver gift-wrapped Christmas presents to all of the good little boys and girls. But if come up with the wrong answer to the math problems in the glyph, you might end up making a mine scene, with a grizzled miner and his tools, ready to dig deep into the earth to search for precious gems! Thanks very much for supporting our site and our work – we appreciate it! If you celebrate Christmas, I hope that you have a wonderful holiday with your family. Common Core standards: 2.OA.2, 2.NBT.5. Common Core standards: 3.OA.7, 3.NBT.2. Common Core standards: 4.NBT.4, 4.NBT.5. Common Core standards: 5.NBT.5, 5.NBT.7. Common Core standards: 6.NS.2, 6.NS.3.